Roughly speaking, a salt can be considered “soluble” if more than 1 gram of the salt can be dissolved in 100 milliliters of water. Soluble salts are usually assumed to dissociate completely in aqueous solution. Most, but not all, solids become more soluble in a liquid as the temperature is increased. Salts that are “slightly soluble” and “insoluble” still dissociate in solution to some extent. The solubility product (Ksp) is a measure of the extent of a salt’s dissociation in solution. The Ksp is one of the forms of the equilibrium expression. The greater the value of the solubility product for a salt, the more soluble the salt. Let’s look at the solubility expression for AgCl. So there are very small amounts of Ag+ and Cl− in the solution. Let’s say we add 0.10 mole of NaCl to 1 liter of the AgCl solution. NaCl dissociates completely, so that’s the same thing as adding 0.1 mole of Na+ ions and 0.1 mole of Cl− ions to the solution. The Na+ ions will not affect the AgCl equilibrium, so we can ignore them; but the Cl− ions must be taken into account. That’s because of the common ion effect. The common ion effect says that the newly added Cl− ions will affect the AgCl equilibrium, although the newly added Cl− ions did not come from AgCl. Let’s look at the solubility expression again. Now we have 0.10 mole of Cl− ions in 1 liter of the solution, so [Cl−]=0.10 M.
Now the number of Ag+ ions in the solution has decreased drastically because of the Cl− ions introduced to the solution by NaCl. So when solutions of AgCl and NaCl, which share a common Cl− ion, are mixed, the more soluble salt (NaCl) can cause the less soluble salt (AgCl) to precipitate. In general, when two salt solutions that share a common ion are mixed, the salt with the lower value for Ksp will precipitate first. The amount of Gibbs free energy in any given reaction can also be calculated if you know the equilibrium constant expression for that reaction. 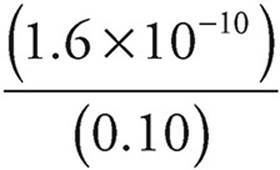 Notice that if ∆G° is negative, K must be greater than 1, and products will be favored at equilibrium. Alternatively, if ∆G° is positive, K must be less than 1, and reactants will be favored at equilibrium.